The canopy of solar panels was erected several months ago along a barren stretch of Fleury Way in Homewood. Then came the bioshelter — a gleaming cabin-sized structure that attracted curious stares from neighbors passing by. Now, power is flowing from the panels to the greenhouse, feeding lights, a ventilation system, and an aquaponics unit that can grow both plants and seafood. The bioshelter is part of an ambitious project to bring cleanly generated energy and locally grown food to Homewood — and to regions around the world — and it is taking off. 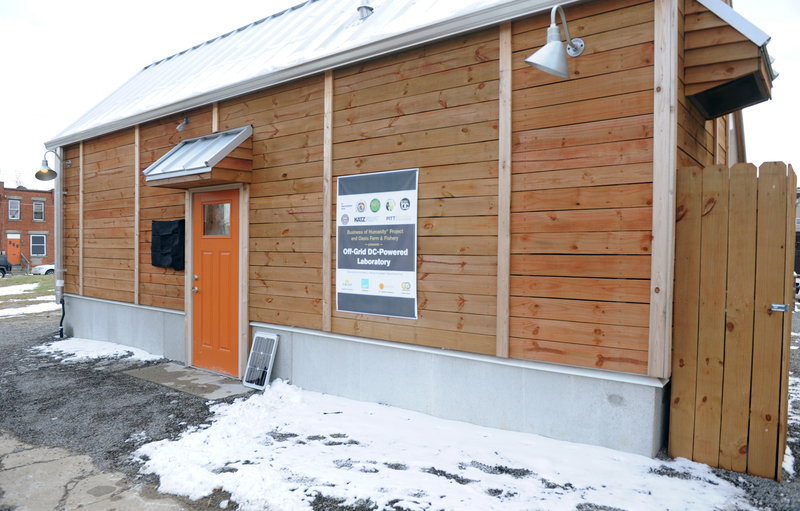 On Thursday, a few dozen people, including Mayor Bill Peduto and Allegheny County Executive Rich Fitzgerald, stopped by to mark the first step in what could be a self-sustaining electric grid in the neighborhood. “We have what is a one-of-a-kind project here,” the Rev. John Wallace, a pastor at the Bible Center Church, which owns the plot of land and a row of houses beside the bioshelter, told the crowd gathered under the solar panels. The bioshelter — another term for a solar-powered greenhouse — was first conceived at the University of Pittsburgh as part of the Business of Humanity program, founded in 2011 to bring together the schools of engineering, business and social work to demonstrate a project that is both environmentally conscious and financially sustainable. “The fundamental idea is somewhat alien to most business schools, but I think it’s becoming more acceptable,” said John Camillus, a business professor at Pitt’s Katz Graduate School of Business, who teaches a graduate course on the subject. For the business model to work, it has to work globally, Mr. Camillus said. The Homewood bioshelter is a proving ground for technologies being built across the globe in India, where nearly one in four residents live off the electric grid. The government is racing to expand power to nearly 300 million people who live in the dark, often using polluting fuels like kerosene. Mr. Camillus and Bopaya Bidanda, a department chair in the Swanson School of Engineering, traveled to their native India last August to exchange knowledge with researchers and charitable foundations there about the Homewood project. So far, at least two partnerships have emerged from that trip. One agreement, negotiated by Mr. Bidanda, sends a group of students from the Indian Institute of Technology in Chennai to expand the solar canopy to power the Bible Center Church’s adjacent property. That would involve wiring the church’s property to create a so-called microgrid, a localized power grid that can be disconnected from the larger, utility-operated grid surrounding it. It would run on direct current — the one-way flow of power produced by solar panels — as opposed to alternating current, on which the U.S. power grid is based. The students could come as soon as May, Mr. Bidanda said. A second agreement, forged by Mr. Camillus, would take lessons learned at the Homewood demonstration to rural Indian villages. Electricity would bring not only a clean source of light and heat to those communities but also the ability to move clean water — providing toilets, sanitation and irrigation systems to improve agriculture. During the August trip, Mr. Camillus visited a site in the village of Tuvar and promised to bring a bank of solar panels. He plans to send Pitt students to India to help oversee that project. Working with a developer called Safe World, Mr. Camillus plans to provide lights, build community toilets and provide 30 to 50 acres of irrigated farmland to grow premium crops that can be shipped to other countries. He expects the developer could reap 9 percent return on investment, and village residents will be employed to oversee the network. Rev. Wallace, who also teaches community health and social justice in the University of Pittsburgh’s School of Social Work, said he’s long been concerned about affordable housing. With a $600 utility bill in the winter, he said, the energy burden on low-income households can be significant. If the solar installation were to be scaled up to feed the surrounding houses, it could ease the energy burden on Homewood residents by providing affordable power at a stable rate. “It really has been an experiment, and we’re learning along the way,” Rev. Wallace said. The project fits into the city’s goal to develop a “grid of microgrids,” with the city signing a deal in 2015 to develop a plan with researchers with the U.S. Department of Energy. Mr. Peduto said he was inspired to pursue microgrids while attending the first Business of Humanity conference in Prague in 2013. There, he learned more about the inefficiencies of the century-old electric grid, which transports power over long distances from the power plant to the consumer. “You’re producing all this energy 100 miles away, and yet only 38 percent of it is ever getting used,” Mr. Peduto said. “Or we can produce energy right at the site. And have over 98 percent efficiency by using DC power. And that’s the way the world’s going to go.